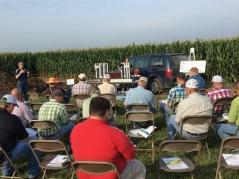 MONMOUTH, Ill. – The Northwestern Illinois Agricultural Research and Demonstration Center near Monmouth has scheduled a field day for July 18. University of Illinois crop sciences faculty, researchers, students, and Extension specialists will address issues pertinent to the 2018 growing season. The program will begin promptly at 8:00 a.m. on Wednesday, July 18, and is open to the public at no cost. Weather permitting, presentations will take place outside next to research plots. Participants will board buses to tour portions of the farm. Certified Crop Advisors may earn two continuing education units (0.5 – SW, 1.5 – IPM). The Northwestern Illinois Agricultural Research and Demonstration Center is a 320-acre facility, established in 1980. The center is located 1 mile north and 4 miles west of Monmouth at 321 210th Avenue. Each year, more than 40 projects are conducted by campus-based project leaders and the center superintendent.